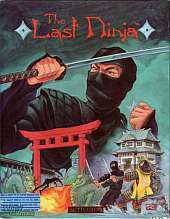 The Last Ninja was one of the most successful games ever for the Commodore 64 with over 2 million copies sold worldwide for all formats. You are the last living member of your ninja clan after they were brutally slaughtered. Now, you seek to exact revenge on the evil shogun responsible. It's an action/adventure game set in medieval Japan. The game is shown in isometric view, and the eponymous ninja can walk in four directions, jump, fight the enemies and collect necessary items on his way. While fighting, the ninja can use several different blows and block. The island is made up of six regions: The Wastelands, The Wilderness, The Palace Gardens, The Dungeons, The Palace, and The Inner Sanctum. Along the right side of the screen players can see the current enemy's health, weapons in use, and object being held. Across the bottom of the screen is your health, number of lives, and weapons in your possession. While exploring the island a number of items can be found and some of them must be found: a pouch, key, numchukas, sword, apples, smoke bombs, claw, glove, staff, shuriken stars, amulet, flower, rope, bottle, and scrolls. The game is one of the first isometric games on the market. Despite relatively primitive (EGA) graphics, characters move convincingly, and backgrounds are well-drawn to create good illusions of 3D landscape. Another nifty innovation is the fact that the game's terrain is merely not the non-interactive pretty scenery as in most other games: they are obstacles that must be overcome. Water is deadly to the ninja and there's some hard jumping puzzles to avoid it. The PC version has higher resolution graphics but brighter colors and no music.